Bricks leading to the schoolhouse are reserved for people who attended or taught in a 1-room school house! 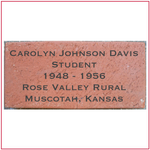 Bricks for the Schoolhouse are reserved for those who attended or taught in a 1-room school house. Information will be formatted to meet the engraver's requirements. Please provide the needed information. Bricks are installed and "unveiled" twice each year. Orders received after August 1 will be installed by April 1 of the following year. If you're not a member of Friends of the Farmstead, please consider joining today and reaping all the great benefits!